Former Rep. John Dingell, the longest serving representative in U.S. history and the last of a immensely influential generation of public servants, has died at age 92. Dingell delighted people across the U.S. with his sassy takes on politics which he shared via his Twitter account while both in office and after retiring in 2015. 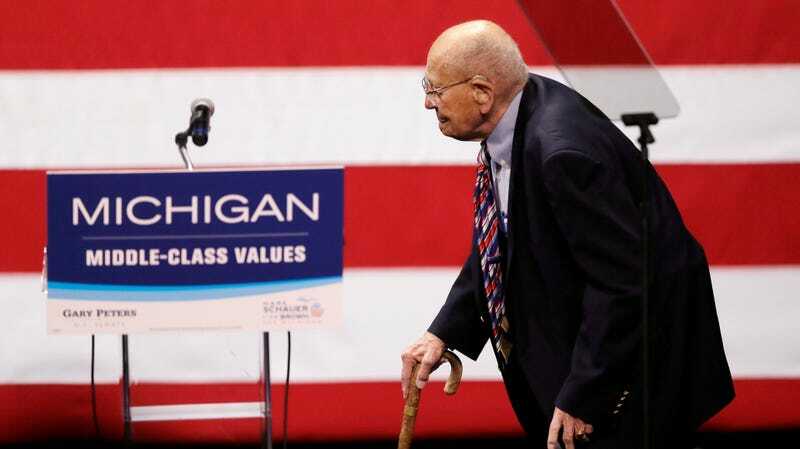 His funny way with social media will be missed, but it is particularly in Michigan and its auto industry, where Dingell was a constant presence on the political scene for over 59 years, that his absence will perhaps be the most deeply felt. Dingell began his lifetime of service as a Congressional page when he was just 12-years-old in the U.S. House of Representatives from 1938 to 1943, where as a 15-year-old he watched president Roosevelt give his famous “Date Which Live In Infamy” speech following the Japanese attack on Pearl Harbor from the House floor. In 1944 he joined the U.S. Army, where he rose to second lieutenant and would have had to participate in an invasion of Japan had the two atomic bombs dropped on that country not ended the war. He then went on to get his law degree from Georgetown and, in 1955, won a special election to replace his recently deceased father, Rep. John Dingell, Sr., as representative for the 15th Congressional district in Michigan. As a Michigan congressman, Dingell was a champion of both the auto industry and the working class. During debate in 1977 to amend the Clear Air Act, Dingell worked for a favorable outcome for the car industry, instead of the air. The 1977 revision addressed specifically automobile emissions and in particular three pollutants—hydrocarbons (HC), carbon monoxide (CO) and nitrogen oxide (NOx). Auto industry executives had already received three postponements to implementing these standards—two by the EPA and one by Congress—and insisted after seven years their companies still could not meet standards. While the auto companies did gain another extension, the bill didn’t include the relaxed targets that Dingell was pushing for. Gasoline vapor, though a relatively minor contributor to urban smog problems, had been classified by the EPA as a probable carcinogen that caused an estimated 75 cancer deaths a year. Dingell, standing behind former senator Ted Kennedy at an Alzehimer’s bill announcement, 1987. While The League of Conservation Voters Scorecard gave the former representative a 100 percent rating his last few years in office and a 75 percent rating overall, Dingell eventually lost his chair on the Energy and Commerce Committee in 2008 due to fellow Democrats feeling that he wasn’t taking environmental policy seriously, the Washington Post reported. Even after losing his powerful position however, Dingell still fought for the auto industry, personally writing President Obama and urging him to make more funds available to the industry. It wasn’t just the domestic auto industry Dingell was interested in protecting. While Dingell supported the 2008 bailout of GM and Chrysler, he also oversaw the Affordable Care Act’s passage through the House, and he supported the Civil Rights Act of 1964. Dingell was a leading Democratic voice for the NRA, and for years was on the National Rifle Association’s board of directors. While championing the interests of the auto industry he also co-authored the Energy Policy and Conservation Act of 1975, which created the first corporate average fuel economy in the nation as well as the 1973 Endangered Species Act and the 1990 Clean Air Act—which only passed after a decade of contention with members of both parties. Dingell retired from the House in 2015, becoming one of the last people to serve in World War II to leave Congress. John Dingell was active in public life until a heart attack in September of 2018. His family announced he would be entering hospice care earlier this week after a battle with prostate cancer. Live From John Dingell&apos;s New Cell Phone Lane At Detroit Metro!